MY PREFIX HAS BEEN REGISTERED WITH THE GCCF FOR MANY YEARS AND I AM A LONG TERM MEMBER OF THE PROGRESIVE RAGDOLL CAT CLUB AND THE KENTISH CAT CLUB. ALL MY BREED CATS ARE REGISTERED WITH THE GCCF AND ARE GENETICALLY HCM AND PKD NEGATIVE FOR GENERATIONS. I FOLLOW THE GCCF'S IMPARTIAL CODE OF ETHICS WHEN BREEDING AND RAISING KITTENS. 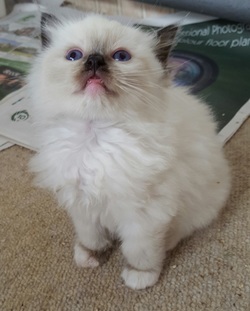 ADORING RAGDOLLS ARE A SMALL EXPERIENCED AND ETHICAL HOBBY RAGDOLL BREEDERS WHO HAVE BEEN BREEDING TOP QUALITY RAGDOLL KITTENS IN KENT, LONDON AND SOUTH EAST SINCE 2001. 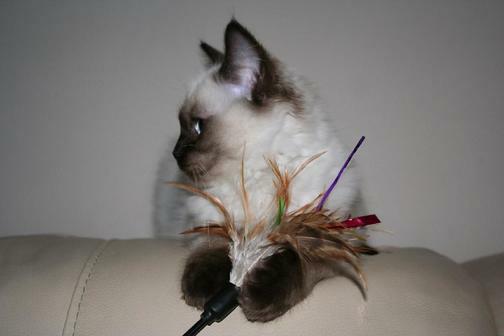 PLEASE VIEW MY TESTIMONIAL PAGE FOR FEEDBACK FROM SOME ADORING RAGDOLL KITTENS NEW OWNERS. My name is Suzy I live with my partner Russ, our two Chihuahuas Taz who's 14 yrs old and Snowy who's 7 yrs old and of course our beloved ragdoll cats, which you can see on this website. We all live on the Kent coast near Herne Bay right by the sea. Ours dogs and us love walking along the nearby beach and our cats love to watch the large selection of birds here. Herne Bay is just over an hours drive from South London and makes a lovely day out by the Sea, We are only 6 miles from the City of Canterbury with its impressive Cathedral and historic buildings and 20 miles from the port of Dover with its splendid Castle. So come and explore the coast and surrounding areas of the garden of England. I have been Studying, Showing and Breeding Ragdoll cats as a hobby since 2001 so have a wealth of knowledge and experience regarding the breed. We started off very slowly owning one pet breed girl called "Donjelami Dolly Daydream" for the first five years. We really enjoyed this experience and gradually started to learn more about breeding, whelping and raising healthy kittens, Our aim is to maintain and preserve the British GCCF Ragdoll breed Standard of Points for the Ragdoll. 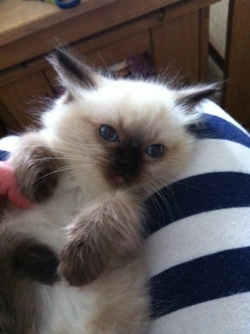 I could not imagine my life ever being without a Ragdoll cat now, they really are addictive. We very occasionally have kittens available as pets as when we decide to breed a litter unfortunately we can’t keep them all. The money I receive for kittens helps towards the costs of my very expensive hobby. Please note it costs me thousands of pounds every year to keep my pampered pets happy and healthy and many many hours of unpaid work. A holiday well that’s a luxury we seldom get. Please note however that when you take one of my babies home and become their ragdoll slave and admirer your life will never be the same, they are enchanting pets. I will of course be happy to offer ongoing support around how to keep your pampered pet happy and healthy. I have shown my Ragdolls regularly over the years to learn about good type and temperament (you can see photos and write up on their success on my show page). Our kittens are raised in my home, usually starting off in my bedroom and then when they start walking they are moved to their playroom and have supervised access to the rest of the bungalow so they get lots of kisses and cuddles from my family and two pet Chihuahuas to help socialise them and develop their confident friendly temperaments. Please note that Ragdolls are house cats that should only be allowed supervised access to a secure outside garden. They should not be allowed to free roam, this is to ensure their ongoing health and safety.